The month of May has more designated observances for aging in place professionals than any other month of the year. 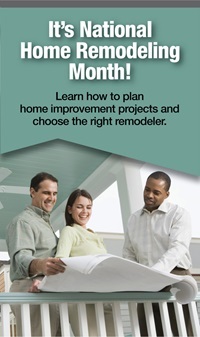 For starters, it’s “National Home Remodeling Month,” and what is the CAPS program all about if not remodeling and modifying homes for people to help them adapt and live more comfortably and safely as they age. People overwhelmingly want to continue living in the current home as the age and don’t want to face the prospects of moving to a different residence or having to move to a retirement facility or nursing home – for a variety of reasons including economic. Right in line with “National Home Remodeling Month” and continuing the focus on aging-in-place needs, May is also “National Mobility Awareness Month,” “National Older Americans Month,” and “Building Safety Month Week One: ‘Building Solutions for All Ages’.” Since so much of what we do as aging in place professionals deals with accessibility and mobility, these designated observances are quite appropriate for us. “National Nurses Week” is May 6-12 (with Florence Nightingale’s Birthday remembered on May 12th), “National Emergency Medical Services Week” is May 15-21 (including all first responders), and “National Senior Health & Fitness Day” is May 25th. Of course, Mother’s Day (May 8th), Peace Officers Memorial Day (May 15th), Armed Forces Day (May 21st), and Memorial Day (May 30th) are also part of the May observances. No matter which day it is during the month of May – this year or any year – there is something noteworthy that impact the aging in place market and the services we create and implement. There could be – and likely are – even more celebrated days and weeks during May that involve some aspect of what we are all about and the general services we provide and render. The dates and designations mentioned are the most commonly cited ones. Other months have their share of observances that are important for us to note and remember, but May has more than any other that are specific to our industry. Let’s keep these dates in mind as we work with and interact with our clients and their families. Be sure to promote them in the workplace and among our circle of professionals and strategic partners – to help raise awareness for them. Let’s have a great month of May as spring is in full swing and we have many observances that call attention to the important work that we do.